A Blended Soup - The Sky's The Limit! For a while, that was the one and only blended soup I attempted. Thankfully, I have now learned how to create a blended soup on the fly, without a recipe, just by following a basic blueprint. I serve my family a blended soup every few weeks — it's an excellent way to use up veggies that may spoil otherwise. What Is A Blended Soup? A blended soup is the perfect meal to serve someone who's recovering from an illness, especially of the gastrointestinal type, when they need something healing but not heavy. They are a delightfully clever way to get veggies into children or others who have a difficult time with certain textures. They are also easily digested and full of vital minerals from the bone broth and vegetables, plus they contain healing fats since the vegetables need to be cooked prior to blending. And, the sky's the limit! Use up any stray produce you may have: an extra potato that didn't get baked, bits of broccoli or red pepper from a party tray, zucchini that's gone soft, wilty herbs that might be thrown out anyway… Anything is fair game. There are several staple vegetables, such as onions, which I use in every blended soup I make because it creates such a wonderful base of flavor. Carrots are also wonderful. After that, I raid my fridge and pantry to see what I can come up with. I rarely have to buy ingredients specifically for making blended soups. We buy a LOT of produce, so it's normal for me to have a few things at the end of the week that either I didn't use or don't look as great as they did when I brought them home from the store. Instead of throwing my produce (and my money) in the trash, I blend it (my produce, not my money 😉 ) into a soup. 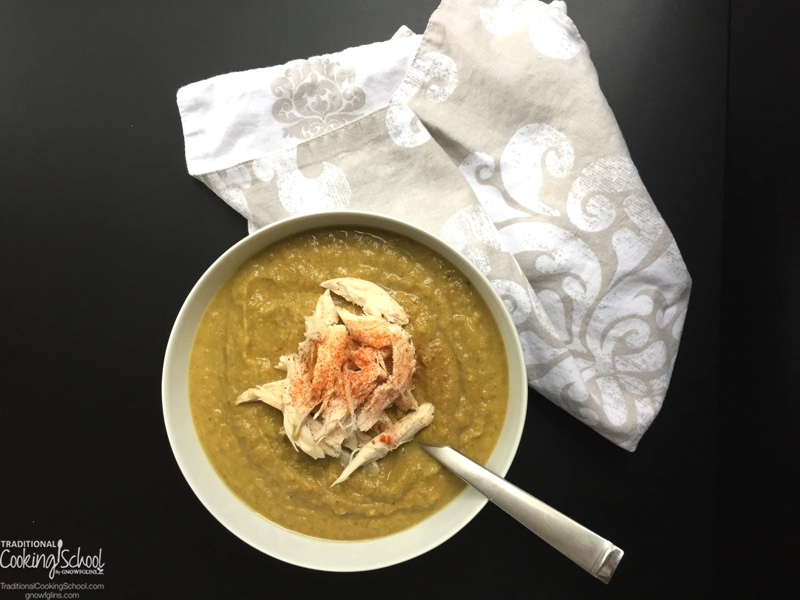 Winter is a particularly great time of year for blended soup because of the bounty of winter squashes and root veggies available, not to mention the comfort of a steaming bowl of soup on a cold day. Today, I'm going to give you a basic blueprint to follow and then turn you loose to get creative with your own versions of blended soup! *Since vegetables take on flavors so well, think creatively. Any dried or fresh herbs, such as rosemary, basil, or thyme will add incredible freshness and flavor. Dried spices such as cumin and paprika will add a smokey or Mexican-inspired flavor. Caraway, curry powder, or turmeric are good choices if you like Middle Eastern or Indian cuisine. Cayenne will give your soup a kick. Melt the fat in your Dutch oven or large pot. Add onions and other vegetables that need longer cooking time, such as diced sweet potatoes, carrots, parsnips, or rutabaga. If using tender veggies like zucchini, broccoli, greens, or peppers, cook them for less time. Add in bone broth just to cover. You can always add more broth later if you want a thinner soup, but you can't take it away once you've added it in. Bring to a simmer. When the veggies are fork tender, it's time to season and blend! If you have an immersion blender, simply whir it around your pot until your soup is the consistency you want it to be. You can leave chunks or puree until smooth — it's totally up to your preference. If using a stand-up blender, blend soup in batches. Be VERY careful! Hot soup has a tendency to explode in a blender. If your blender has a vent, you'll want to keep it open and blend on the lowest possible speed. If your soup is too thick, add a bit more broth — or even better, heavy cream (or coconut milk for you dairy-free folks). Mmmmmm! Once soup is blended, check seasonings again. Add more of whatever you think it needs, and serve! Bonus: Blended soups freeze really well, so make a bunch to have on standby for a busy day or illness later on. In this blended soup, the amount of veggies equaled approximately 8 cups. After sauteing the onions, leeks, and carrots in coconut oil until the onions were translucent, I added the broccoli and then chicken stock. I always begin a soup with 2 quarts of stock, but for blended soups, I pour in just enough to cover my veggies. In this case, I used 1-1/2 quarts. After simmering for 10 or so minutes, until the broccoli stems were soft, I added garlic cloves and seasonings to my pot. Then I began blending with my immersion blender. Sometimes, I leave small chunks of veggies in my blended soups so that they feel more substantial, but I wanted this one to be completely smooth since I planned to serve it as a side dish. There were plenty of leftovers to serve the soup for lunch the next day with toppings and a side of fruit. My children topped theirs with grated raw cheddar, and my husband and I topped ours with some leftover roasted chicken. This soup was delicious! I'll definitely be using this combination again! Still Don't Know What Veggies to Use? Although toppings are totally optional, I highly recommend experimenting with them. They add flavor and textural components that really take a blended soup to the next level. Speaking of toppings, this can be a great way to add fermented foods to your meals! If your husband is like mine and really needs something more substantial than a blended soup can provide, consider serving your blended soups as a side rather than the main course. A blended soup is a wonderful compliment to roasted meats, wraps, or a hearty sandwich. If you are a member of a CSA, you may have found yourself perplexed with using an unfamiliar item a time or two. Blended soup to the rescue! 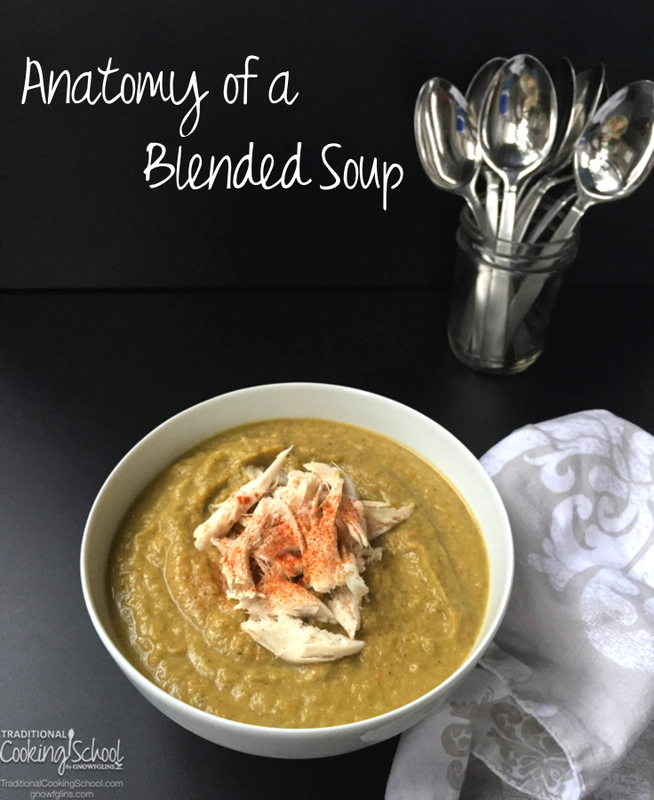 I hope you enjoy creating your own blended soups this winter — and the rest of the year! Do you enjoy blended soups? How do you use up your extra veggies? We have a soup night once a week, usually on Monday and then eat the leftovers throughout the week. Carrots, celery, and onion are always a staple and I do typically blend at least part of it instead of thickening the broth. I love some of your recommended combos. I frequently get in a rut and am always looking for new ideas. Oh yes, carrots, celery, and onions are the holy trinity of soup bases, Jenny! White beans add protein and lend a creamy texture to a blended soup. They don’t have a lot of flavor of their own, so they let the rest of the soup shine. Thanks for that tip, Elisabeth! Have you tried Cucumber in a blended soup? Also if I don’t have celery on hand do you think I could substitute the stem of some Bok Choy?